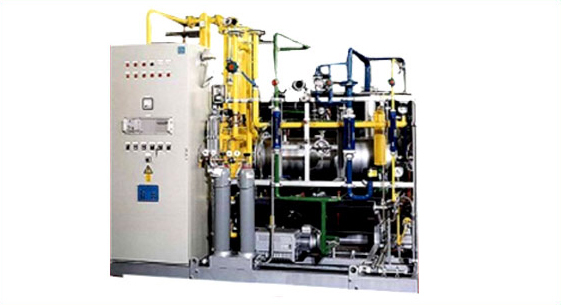 Endo And Exo Gas Generators In view of fundamental importance of carbon in determining the mechanical properties of steel, special attention has been devoted to those controlled atmosphere processes requiring control of carbon exchange between the furnace atmosphere and work being treated. To characterize the carbon exchange, the term carbon potential has been introduced (this denotes the carbon content which a pure iron specimen takes up in equilibrium with thw furnace atmosphere). The endothermic gas yields a potential between 0.7 to 0.9 which corresponds to the surface carbon content aimed at in the majority of processes. Endothermic atmospheres are used principally in the heat treatment of carbon steels and may be slightly carburizing to low carbon steels. These atmospheres have sufficient reducing constituent to prevent effectively any oxidation of the material being processed. They are substantially neutral to carbon steels. Endothermic gas is produced by the reaction of an air-gas mixture ranging from 25 to 40 % of perfect combustion. Since reaction in this range is endothermic, it is necessary to supply external heat. The process is based on single catalytic cracking of LPG or natural gas with accompanying admission of air at such a rate that the product gas after cracking contains only CO, H2, N2 and traces of CO2 and moisture. CO : 28 to 30 % H2 : 20 to 25 % CO2 : 0.1 to 0.5 % N2 : Balance Our endothermic gas generator consist of a mixer unit, cracking retort, gas cooler and control panel. All equipments are accommodated in a single compact unit. The reaction takes place in presence of high activity catalyst at a working temperature around 1050 deg C. Heating of the retort is affected electrically by heating elements around the retort. Feed Stock : LPG or Natural Gas. Capacities : 5 NM3/hr to 100 NM3/hr packaged unit. N2 : balance these are normally used for bright annealing of copper, scale-free annealing of brass and similar operation on non-ferrous metals. N2 : balance the composition of atmosphere gas depends on composition of fuel also. The presence of reducing constituents Co & H2 will effectively prevent the oxidation of many metals. These atmospheres are , therefore, ‘reducing’. However, since appreciable amount of Co2 is present, the atmosphere becomes decarburizing in character. Exothermic atmosphere with Co2 and water removed both co2 and water vapors are decarburizing agents. When held to the minimum, they do not present too serious an interface to the expected use. In certain application, only water need to be removed from the gas. Raw Exo-Gas Type : Where the products of combustion are directly used as. Protective gas. Partially Dry Exo-Gas Type : Certain applications require only partial removal of moisture to prevent oxidation and decarburization. In these, the gas are passed through a refrigeration unit to reduce the dew point to around plus 5 deg c.
Perfectly Dry Exo-Gas Type : Eherever materials call for moisture free gas generator is followed by a refrigeration unit and then a packaged essicant drier eg. Silica gel, alumina. Here the dew point of the product gas is reduced to around minus 40 deg c.
Natural Gas, LPG, Kerosene, Diesel. 10 nm3/hr to 1000 nm3/hr in various standard sizes.